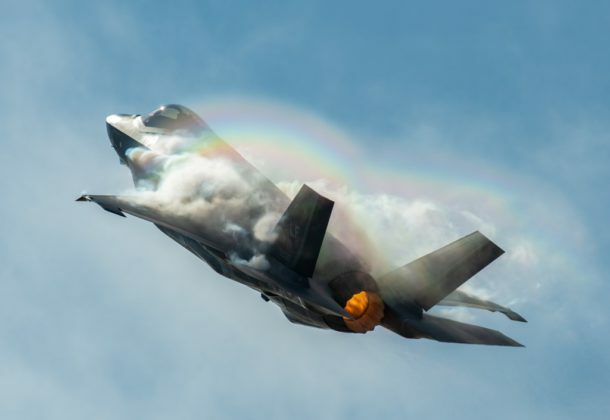 Air Force Times showcases CAPT Andrew “Dojo” Olson, commander of the F-35 Demonstration Team at Luke Air Force Base in Arizona, piloting the fighter jet through death-defying maneuvers. A scathing internal Navy probe into the 2017 Fitzgerald collision that drowned seven sailors details more problems with the crew and superior commands than the service has publicly admitted, reports Navy Times. The report overseen by RADM Brian Fort was submitted 41 days after the June 17, 2017, collision. Navy officials says it was kept secret in part because it was designed to prep the Navy for potential lawsuits in the aftermath of the accident. Despite record earnings, defense firms laid off more than 1,400 workers in 2018, reports Defense One. That number will go over 2,000 when SpaceX cuts 577 workers this month. Layoffs announced in 2018 included Lockheed – 500 at a Sikorsky helicopter plant near Jupiter, FL; BAE – 155 when its Mobile, AL, shipyard closes; Raytheon – 52 in Orlando, FL; GDIT – 101 Chester, VA; L3 Technologies – 62 positions in Waco, TX; Northrop Grumman – 138 in Colorado Springs, CO, and 348 in Chester, VA. And the US arm of Italian defense firm Leonardo began phased layoffs of about 90 in Elizabeth City, NC. More than 17,000 uniformed medical jobs are eyed for elimination, reports Military.com, with plans to re-purpose the physicians, dentists, nurses, technicians, medics, and support personnel billets as war fighters or combat-support skills to increase lethality and size of operational units. Approximately 172,000 Marylanders are directly impacted by the partial government shutdown — and so are state and local government coffers — according to a new report from the State Comptroller’s Office, reported by Conduit Street. These Marylanders have missed out on an estimated $778 million in wages, resulting in $57.5 million less in state and local income tax withholding and $2.1 million less in sales tax collections. No pay for Coast Guard members this pay period, reports Military.com. The Coast Guard’s 41,000 active-duty members were not paid Jan. 15 — payday — due to lack of appropriations in the ongoing government shutdown. Coast Guard Commandant Adm. Karl Schultz promised that their efforts “have not, and will not, be forgotten,” reports Military Times, and offers some options for financial help if your paycheck is shut down. Coast Guard retirees are also in a bind, reports Military.com. They could miss their Feb. 1 paycheck if the government shutdown is not resolved. An AV-8B Harrier embarked with the 22nd Marine Expeditionary Unit was heavily damaged after it ingested a refueling strap during maintenance aboard the Wasp-class amphibious assault ship Kearsarge. A military safety brief listed the incident as a Class A mishap, which is defined by the Navy as an accident where an aircraft is destroyed or sustains $2 million or more in damages. Rep. Anthony Brown (D-MD) launches a local consortium to link small and large aerospace and defense firms and educational institutions in the Pentagon’s backyard, reports Defense News. The Maryland Defense and Aerospace Consortium seeks to spur academic and industry collaboration to to burnish the National Capitol Region’s reputation as an aerospace and defense hub. Chief of Naval Operations ADM John Richardson met this week with his Chinese counterpart in Beijing. USNI reports they addressed adhering to internationally accepted rules governing maritime operations and reducing the risks associated with interactions between the two navies at sea. Rep. Maxine Waters (D-CA) takes over as chairman of the House Financial Services Committee, giving her broad influence over the financial world — from Wall Street regulations to flood insurance, reports The Washington Post. Waters has served in the House since 1991 and is the first African-American and first woman to lead the committee. USNI News Fleet and Marine Tracker: Jan. 14, 2019. Leidos Inc., Reston, Virginia, was awarded a $9,742,355 modification (P00030) to contract W911QX-16-C-0012 for support of Saturn Arch Aerial Intelligence System for day and night image collection and exploitation of Improvised Explosive Device “hot spot” areas. Work will be performed in Bridgewater, Virginia, with an estimated completion date of Sept. 16, 2019. Fiscal 2018 other procurement, Army funds in the amount of $ 2,062,117 were obligated at the time of the award. US Army Contracting Command, Aberdeen Proving Ground, Maryland, is the contracting activity. Valneva USA Inc., Gaithersburg, Maryland, has been awarded a maximum $70,051,600, firm-fixed-price contract for the Japanese Encephalitis Vaccine. This was a sole-source acquisition using justification 10 US Code 2304 ( c)(1), as stated in Federal Acquisition Regulation 6.302-1. This is a one-year contract with no option periods. Location of performance is Maryland and the UK, with a Jan. 14, 2020, performance completion date. Using military services are Army, Navy, Air Force, and Marine Corps. Type of appropriation is fiscal 2019 through 2020 defense working capital funds. The contracting activity is the Defense Logistics Agency Troop Support, Philadelphia, Pennsylvania (SPE2DP-19-D-0001). Lockheed Martin Corp., Baltimore, Maryland, is awarded a fixed-price-incentive firm target modification to previously-awarded contract N00024-18-C-2300 to exercise an option for the construction of one fiscal 2019 littoral combat ship. The specific contract award amount for this ship is considered source-selection sensitive information (see 41 US Code 2101, et seq., Federal Acquisition Regulation (FAR) 2.101 and FAR 3.104) and will not be made public at this time. Lockheed Martin will perform and oversee all necessary design, planning, construction and test and trials activities in support of delivery of this ship to the Navy. Work will be performed in Marinette, Wisconsin (40 percent); Washington, District of Columbia (7 percent); Baltimore, Maryland (6 percent); Beloit, Wisconsin (2 percent); Iron Mountain, Michigan (2 percent); Milwaukee, Wisconsin (1 percent); Waunakee, Wisconsin (1 percent); Crozet, Virginia (1 percent); Coleman, Wisconsin (1 percent); Monrovia, California (1 percent); and various locations below 1 percent (38 percent), and is expected to be completed by February 2026. Fiscal 2019 shipbuilding and conversion (Navy) funding will be obligated at time of award and will not expire at the end of the current fiscal year. The Naval Sea Systems Command, Washington, District of Columbia, is the contracting activity.